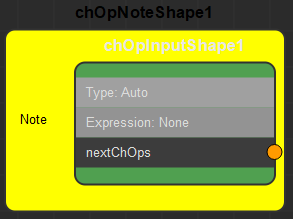 The Channel Operator Note allows to add notes on the graph of Channel Operators (ChOps). These notes have no influence whatsoever on the Channel Operators execution. A Channel Operator Input defines the following specific attributes (accessible trough the Maya Attribute Editor). For common attributes see Channel Operator Common Attributes. Color Color of the Sticky Notes in the Golaem Channel Operator Editor. Text Color Color of text of the Sticky Notes in the Golaem Channel Operator Editor. Min note width Minimum width size of the note in the Golaem Channel Operator Editor. The width will also be increased by the text's length. Min note height Minimum height size of the note in the Golaem Channel Operator Editor. The height will also be increased by the text's length.